We told you about young twins behind Social network LAGbook, Today we caught up with two 19 year-old entrepreneurs from Naperville, Illinois. Kyler W. Juckins and Jeremy A. Markham coincidentally were both born on the same day and attended the same high school and now attend the same college! Juckins founded DinnDinn, an app changing the way we taste and ch0ose the best burger shop in town. TechZulu wanted to know just what DinnDinn is all about! What is DinnDinn and Why the Name? DinnDinn is a virtual fridge for all the dishes, drinks, and desserts you love or hate! It allows you to follow your friends, celebrities, and food connoisseurs to see what food they love or hate, take their recommendations and express your opinion too! On DinnDinn you can become ‘TasteBuds’ with other users by following them and from there you can see their ‘fridge’, tastes, and TasteBuds too! We chose the name DinnDinn because it is something that everyone young and old can relate to. DinnDinn launched on Tuesday, August 28 2012. Jeremy A. Markham, a sophomore in college majoring in Finance and minoring in Chinese and Kyler W. Juckins also a sophomore in college majoring in Political Science and minoring in International Relations. DinnDinn gives its users a virtual fridge where they can upload dishes, drinks, and desserts they love or hate to share with other users. We chose food because we have great love for good food and we also have a lot of experience in the food industry. Both of us have worked in restaurants and we have multiple family members with experience ranging from fine dining to fast food. What is The Story Behind The App? We were eating in Kyler’s kitchen, and asked each other how we can connect with our friends through food and dining. It all started from that one question. After about a year and a half of working on ideas and how we can make DinnDinn successful, DinnDinn finally launched on August 28th. Unfortunately we can’t give too much information about how we’re going to monetize DinnDinn, but what we can say is that the dynamics of web 3.0 will be our guide! Who or Where is Your Target User ? We target a younger audience than our competitors and will initially be launching across the United States. Up to this point we haven’t had to overcome too many big hurdles. We’ve experienced challenges when it comes to having to manage time between work, school, and other jobs. When your company is just starting out there is a lot of work to do not to mention trying to grow your customer base, which in this case means gaining traction with users. This is our dream, though, so there’s no challenge that wont be worth overcoming. We do have one main competitor that’s been around about two and a half years and they currently have over two million users but that does not worry us. Next month we are doing our formal launch in the United States and we are adding cool new features, so we are strong. Any Funding Yet and How Much? At the moment we have not raised any funds yet but we started with Founders Capital. – “DinnDinn shines by allowing users and “Tastebuds” the opportunity to review a dish, drink, or dessert without any grey area. You either love it or hate it. Plan and simple. DinnDinn, allows restaurants to shine by focusing in on what’s important to guests. To many times food reviews lose track of what’s important (the food) and tend to settle on a grey area of happiness. 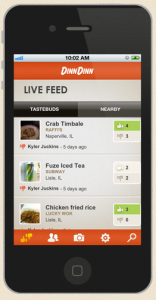 DinnDinn with its ease of use and creative ideas (fridge & tounge) make it a must have app for all foodies. Keep up the great work.” By Kolin on the Google Play store. Checkout out DinnDinn and let us know what your Tastebuds love or hate.